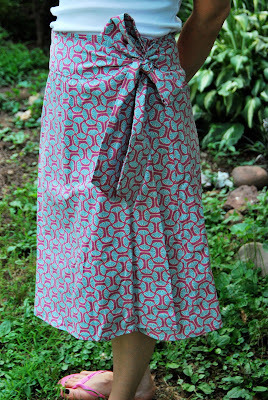 So this is the skirt that is one of my four projects from vacation. I did everything but the buttonhole, which I did when I got home this week. I got the Gingko Timber fabric (by Jessica Levitt) at Purl Soho when we were there this winter. I just fell in love with the colors. I chose this pattern because I wear a lot of A-line style skirts. I think they flatter me best, and they are super comfortable and easy to move around in. Now, I don't know WHO on earth they had write this pattern up, but "skirt in an hour" is just hogwash. The pattern was fairly easy to follow, but the cutting alone took me 25 minutes. Then there was the interfacing, which took another 15. This, by the way, was NOT clear in the pattern, I put interfacing on more pieces than I needed to. Of course, if I did more than scan the directions, I might have looked at the pictures on the last page showing which pieces needed interfacing. Alas, I thought to myself "it's only going to take me an hour, how confusing can it be????" Am I the only one who deludes themselves with these thoughts? That having been said, the only other thing that took time was adjusting the small amount of gathering to get all that fabric inside the curved waist band. Not difficult, just sort of "picky" work. NOT a one hour skirt. A two hour skirt, yes. But to my mathematical mind, they were off by 100%!! I am very pleased with the final garment. I will definitely make another one. I made version A. I might try to make the version with the pockets next time. I did submit this also, to the Sew Mama Sew "Sew it Wear it" Challenge group on flikr. Some great submissions there, if you like to see what other folks are making. A friend of mine and I made skirts one day and she made the one you made. Don't fret because it took her all afternoon to finish this and it still didn't come out right. Something to do with where the tie was for the bow, I think it was on the wrong side. Definitely not a 1 hr skirt, though,by far! I just picked up some McCall's patterns yesterday, and I questioned one of their "hour" patterns. My friend pointed out a little tiny asterik that said "machine time only" or something like that. They don't count cutting and ironing and stuff! And I totally overcomplicate things too. Anyway, the skirt is super cute! I too fell in love with the colors in Timber. I'll be anxious to see her next designs! Love the fabric you used in this gorgeous skirt! Thanks for the review! I'm just now reading this post. Did mention I was living in a cave this summer? Anyway, looks great. Do you know I never made it to Purl to see my fabric there. :( I've only ever seen it in one store and online.